Speaking with BCB podcast host Channie Peters are the director of the BPA show Joanna Hardie; music director Elizabeth Faye; and choreographer Debbie Pierce. BCB took its recording equipment to meet them backstage at BPA while the cast started their Monday evening rehearsal of dance routines on stage. This musical show had rave reviews when it debuted on Broadway and it plays on TV every Christmas. BPA’s version is based on the 1983 American comedy Christmas movie “A Christmas Story”, from Jean Shepherd’s book “In God We Trust: All Others Pay Cash”. For this theater production, BPA will prominently feature a large band of instrumentalists playing the swing and big-band sounds of the 1940s. And the cast will rise to the occasion with a combination of song and dance numbers. 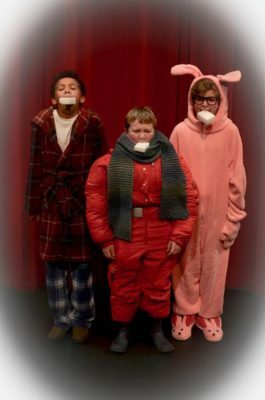 As BPA says, this show offers “sweet nostalgia for adults and great fun for the kids.” It’s set in the early 1940s in a fictional town called Hohman Indiana, and its main character is 9-year-old Ralph Parker who is preoccupied in pursuit of a particular Christmas gift he can’t get off his young male mind. BPA will have a special “pay-what-you-can” preview at 7:30pm on December 1st. 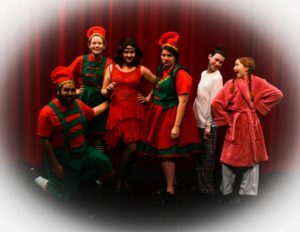 Then, the show runs with matinees and evening performances each day of each weekend from Friday Dec 2nd through Sunday the 18th (with only a matinee show on Saturday Dec 3rd). BPA is hosting an “ugly sweater contest” with a winner and prize at every performance, so, as BPA says, come dressed “in your holiday finest (or worst)”. Tickets are on sale at the Bainbridge Performing Arts (BPA) website.